ManageWP – The Optimal Solution For Rank Tracking? When Vladimir Prelovac started developing ManageWP back in 2010, he had one simple aim – to make it easier to manage multiple WordPress sites. The potential scope of such a service is huge, which is why the ongoing development of ManageWP is so exciting – there are a number of highly valuable features in development right now that we know you will love, and there will be many more in the future. But we are focusing on the present in this post. ManageWP already offers a wealth of features, some of which you may not even know about. And even if you do know about them, you still may not fully comprehend the power that is at your fingertips. Which brings us onto ManageWP’s rank tracking feature. It is one of what we like to call our “in its own right” features, in that it alone justifies the cost of the entire product. 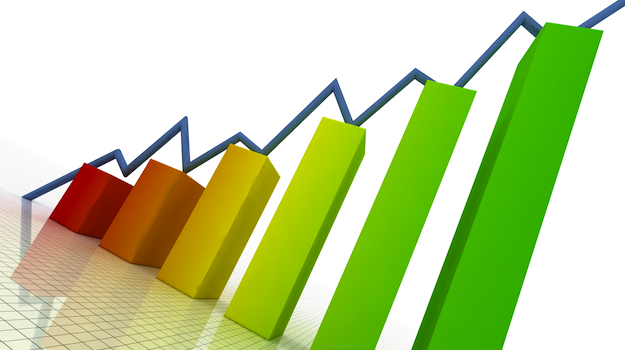 ManageWP’s rank tracking feature is just one amongst a multitude that we offer. Not only that, it places all of the relevant data alongside everything else you need to access in order to manage your sites. There is no need to continuously switch between different services to find what you need. Sound interesting? Great – let’s take a good look at the rank tracking feature itself. You will be presented with a screen with two tabs: “Reports” and “Settings”. As you might expect, the “Reports” tab is where you will be able to see how your websites and individual pages are ranking. But first we must set the tool up, so go ahead and click on “Settings”. 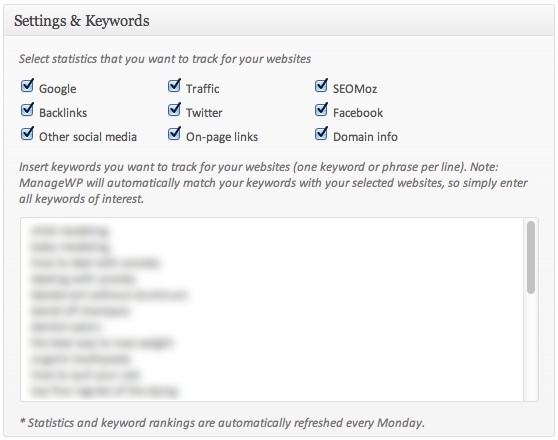 You will see plenty of options here, but in order to set up rank tracking, you need to do just two things. All you need to do is select which sites you want to track rankings for. You can also add URLs that are not managed by ManageWP by hitting the “add custom url” button. Hit the “Save Settings” button once you are done. Don’t worry about the checkboxes at the top – they are for other SEO features (which we will tackle on another day). All you need to do is enter all of the keywords that you wish to track in the text box. You don’t even need to select which keyword applies to which website – ManageWP will figure it out for you. At the time of publication, you are able to add 5 times as many keywords as your website limit. So if you are on a package that permits you to manage 25 sites, you will be able to track 125 keywords. There are three main elements to the Reports page. 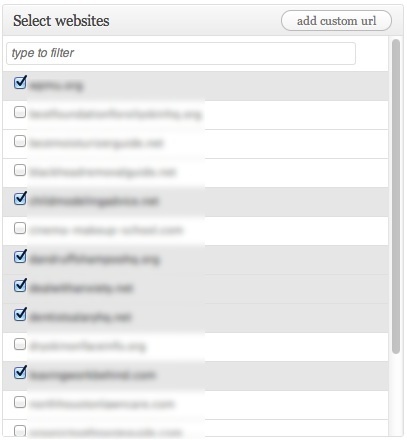 The list of domain names will be automatically filtered as you type in your search query. ManageWP – a Cure for Rank Tracking OCD? As you can see, ManageWP offers you a truly comprehensive means by which you can track keyword rankings across all of your sites. But we haven’t even revealed one of the best features: it is only updated once per week, on a Monday. Most SEOs spend far too much time obsessing over how keywords are ranking day to day, when they could be doing far more productive things with their time. ManageWP forces you to check your rankings just once per week. What Do YOU Think About Our Rank Tracking Service? We are really proud of what we have developed, but are always looking for suggestions as to how we can improve ManageWP. So if you have any feedback or constructive criticism regarding our rank tracking service, please take this opportunity to let us know in the comments section! I don’t know if I have misunderstood this completely, or if the service should be used in a way that I haven’t still understood. As I understand it you use the same list of keywords for all your websites. However, if you are serving different customers with totally different business – like one site with a cleaning service, one with a software consulting firm, and one for a local café. Why would you want to know how the software firm ranks for “cleaning”, and why would you like to know how the cleaning service and the café ranks for “software engineering”? Is there something that I haven’t understood really, because the way this service is made does not make any sense to me. I’ll jump on the bandwagon with reporting features here. If you had a report, in which you could select which sections to include, the value of this would go up quite a bit. I’m not entirely sure that I understand the number of keywords available, tough. Let’s say you have 5 sites, does this mean you’re allowed 5 keywords each, or 5×5=25 keywords for each website? If there would be a report-function (export whitelable pdf) for each costumer this feature would be absolut fantastic! If you can create this abilty to send reports I’m in! It’s that simple. Sorry, meant to add I’m in for an upgrade. Also, been waiting forever for the ‘website back up email notification to owner’ feature to be added. I like it, but I want an email report to be generated for each website. I want to be able to send this data to clients. You’ve already done all the heavy lifting why not take it this last step and then it makes your service a good value to agencies not just content networks. The way it is now, it’s a great tool for content networks, but not for agencies who want to see it themselves (of course) but would also like to share this data with clients (which I’m managing with your tool). Am I right? I agree with @west17media. That would be a great feature-add.